For other uses, see Bonaparte (disambiguation). The House of Bonaparte is an imperial and royal European dynasty founded in 1804 by Napoleon I, a French military leader who had risen to notability out of the French Revolution and who in 1804 transformed the First French Republic into the First French Empire, five years after his coup d'état of November 1799. Napoleon turned the Grande Armée against every major European power and dominated continental Europe through a series of military victories during the Napoleonic Wars. He installed members of his family on the thrones of client states, extending the power of the dynasty. The House of Bonaparte formed the Imperial House of France during the French Empire, together with some non-Bonaparte family members. 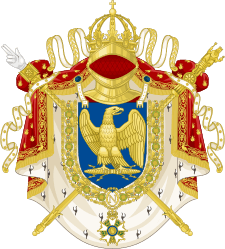 In addition to holding the title of Emperor of the French, the Bonaparte dynasty held various other titles and territories during the Napoleonic Wars, including their ancestral Kingdom of Italy, the Kingdom of Spain, the Kingdom of Westphalia, the Kingdom of Holland, and the Kingdom of Naples. The dynasty held power for around a decade until the Napoleonic Wars began to take their toll. Making very powerful enemies, such as Austria, Britain, Russia, and Prussia, as well as royalist (particularly Bourbon) restorational movements in France, Spain, the Two Sicilies, and Sardinia, the dynasty eventually collapsed thanks to the final defeat of Napoleon at the Battle of Waterloo and the restoration of former dynasties by the Congress of Vienna. During the reign of Napoleon I, the Imperial Family consisted of the Emperor's immediate relations – his wife, son, siblings, and some other close relatives, namely Joachim Murat, Joseph Fesch, and Eugène de Beauharnais. 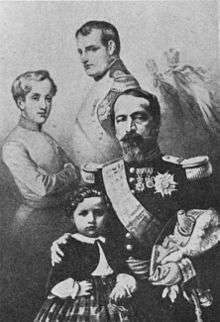 Between the years 1852 and 1870 there was a Second French Empire, when a member of the Bonaparte dynasty again ruled France: Napoleon III, the son of Louis Bonaparte. However, during the Franco-Prussian War of 1870-1871 the dynasty was again ousted from the Imperial Throne. Since that time there has been a series of pretenders. Supporters of the Bonaparte family's claim to the throne of France are known as Bonapartists. Current head Jean-Christophe, Prince Napoléon, has a Bourbon mother. The Bonaparte (originally Buonaparte) family were from minor Italian nobility who held most of their property in the hill town of San Miniato near Florence, Italy. The name derives from Italian, buona, "good" and parte, "part" or "side". After settling in Florence the family enjoyed a relationship with the then ruling Medici family. Jacopo Buonaparte was a friend and advisor to Medici Pope Clement VII. Jacopo was also a witness to and wrote an account of the sack of Rome, which is one of the most important historical documents recounting that event. Two of Jacopo's nephews, Pier Antonio Buonaparte and Giovanni Buonaparte, however, took part in the 1527 Medici rebellion, after which they were banished from Florence and later were restored by Alessandro de' Medici, Duke of Florence. Jacopo's brother Benedetto Buonaparte maintained political neutrality. The family later separated into two branches; One stayed in San Miniato, and the other moved to Sarzana. Buonaparte-Sarzana, Nobili di Sarzana had been compelled to leave Florence due to the defeat of the Ghibellines. A member of the Sarzana branch and ancestor to Napoleon, Francesco Buonaparte came to Corsica in 16th century when the island was in Genoese possession. The Buonaparte tomb lies in the Church of San Francesco in San Miniato. The last member of the Italian branches was a canon named Gregorio Bonaparte, who died in 1803 leaving Napoleon as heir. 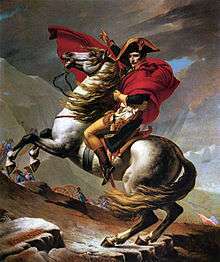 Napoleon Crossing the Alps (1801), by Jacques-Louis David. Napoleon is the most prominent name associated with the Bonaparte family because he conquered much of the Western world during the early part of the 19th century. He was elected as First Consul of France on 10 November 1799 with the help of his brother, Lucien Bonaparte, and president of the Council of Five Hundred at Saint-Cloud. He was crowned Emperor of the French and ruled from 1804–1814, 1815. Following his conquest of most of Western Europe, Napoleon I made his elder brother Joseph (1768–1844) king first of Naples (1806–1808) and then of Spain (1808–1813), his younger brother Louis (1778–1846) King of Holland (1806–1810) (subsequently forcing his abdication after his failure to subordinate Dutch interests to those of France) and his youngest brother Jérôme Bonaparte (1784–1860) King of Westphalia, the short-lived realm created from some of the states of northwestern Germany (1807–1813). Napoleon's son Napoléon François Charles Joseph (1811–1832) was created King of Rome (1811–1814) and was later styled Napoléon II by loyalists of the dynasty, though he only ruled for two weeks after his father's abdication. Louis-Napoléon (1808–1873), son of Louis, was President of France in 1848–1852 and Emperor in 1852–1870, reigning as Napoleon III; his son, Napoléon, Prince Imperial (1856–1879) died fighting the Zulus in Natal, today the South African province of KwaZulu-Natal. With his death, the family lost much of its remaining political appeal, though claimants continue to assert their right to the imperial title. A political movement for Corsican independence surfaced in the 1990s which included a Bonapartist restoration in its programme. Maria Paola or Marie Pauline Bonaparte (1780–1825) Princess and Duchess of Guastalla, married in 1797 to French General Charles Leclerc and later married Camillo Borghese, 6th Prince of Sulmona. Prince Achille Murat (1801–1847), married Catherine Willis Gray (1803–1867), great-grandniece of George Washington. Prince Napoléon Lucien Charles Murat (1803–1878), married Caroline Georgina Fraser (1810–1879). Joachim Joseph Napoléon Murat, 4th Prince Murat (1834–1901), Major-General of the French Army, married firstly Malcy Louise Caroline Berthier de Wagram (1832–1884) and had issue, and secondly Lydia Hervey, without issue. Prince Louis Napoléon Murat (1851–1912), married in Odessa, Eudoxia Mikhailovna Somova (1850–1924), had issue now extinct in male line. The arms of the Bonaparte family were: Gules two bends sinister between two mullets or. 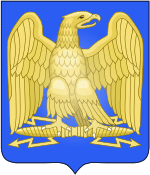 In 1804 Napoleon I changed the arms to Azure an imperial eagle or. The change applied to all members of his family except for his brother Lucien and his nephew, the son from Jerome's first marriage. 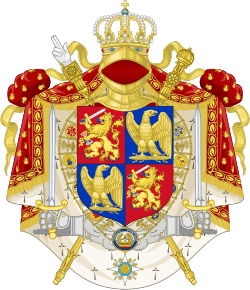 Arms of Napoleon I and Napoleon II, as Emperor of the French. Arms of Joseph Bonaparte, King of Spain. Arms of Lucien Bonaparte, Prince of Canino and Musignano. 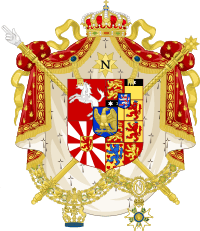 Arms of Louis Bonaparte, King of Holland. Arms of Jérôme Bonaparte, King of Westphalia. According to a studies by G.Lucotte and his coauthors based on DNA research since 2011, Napoleon Bonaparte belonged to Y-DNA (direct male ancestry) haplogroup E1b1b1c1* (E-M34*). This haplogroup, rare in Europe, has its highest concentration in Ethiopia and in the Near East (Jordan, Yemen). According to the authors of the study, "Probably Napoléon also knew his remote oriental patrilineal origins, because Francesco Buonaparte (the Giovanni son), who was a mercenary under the orders of the Genoa Republic in Ajaccio in 1490, was nicknamed The Maure of Sarzane " The latest study identifies the common Bonaparte DNA markers from Carlo (Charles) Bonaparte to 3 living descendants. Lucotte et al. published in October 2013 the extended Y-STR of Napoleon I based on descendant testing, and the descendants were E-M34, just like the emperor's beard hair tested a year before. The persons tested were the patrilineal descendants of Jérome Bonaparte, one of Napoleon's brothers, and of Alexandre Colonna-Walewski, Napoleon's illegitimate son with Marie Walewska. These three tests all yielded the same Y-STR haplotype (109 markers) confirming with 100% certainty that the first Emperor of the French belonged to the M34 branch of haplogroup E1b1b. However, Professor Lucotte also tested the Y-DNA of Napoleon III's hair and that of Jean-Marc Banquet d'Orx, a presumed descendant through one of Napoleon III's illegitimate sons, the Count of Orx. The results revealed that Jean-Marc Banquet d'Orx was indeed Napoleon III's patrilineal descendant, but that the two men belonged to haplogroup I2, and therefore did not share the same paternal lineage as Napoleon I. The headship of the family is in dispute between Charles, Prince Napoléon, born 1950, great-great-grandson of Jérôme Bonaparte by his second marriage; and his son Jean-Christophe, Prince Napoléon (born 1986) who was appointed heir in the will of his grandfather Louis, Prince Napoléon. The only other male member of the family is Charles's recently married brother, Prince Jérôme Napoléon (born 1957). There are no other legitimate descendants in the male line from Napoleon I or his brothers. There are, however, numerous descendants of Napoleon's illegitimate, but recognized son Alexandre Colonna-Walewski from his union with Marie, Countess Walewski. A descendant of Napoleon's sister Caroline Bonaparte is the actor René Auberjonois. Recent DNA matches with living descendants of Jerome and Count Walewski have confirmed the existence of descendants of Lucien Bonaparte, Napoleon's brother, namely the Clovis family. ↑ Drake, Joshua F. (October 2005). "The partbooks of a Florentine ex-patriate: new light on Florence, Biblioteca Nazionale Centrale Ms. Magl. XIX 164–7". Early Music. 33 (4): 639–646. doi:10.1093/em/cah154. ↑ Burke, Sir Bernard (1869). Vicissitudes of Families. London: Longmans, Green, Reader, and Dye. ↑ Lucotte, Gerard; Thomasset, Thierry; Hrechdakian, Peter (2011). "Haplogroup of the Y Chromosome of Napoléon the First". Journal of Molecular Biology Research. 1 (1). doi:10.5539/jmbr.v1n1p12. 1 2 Lucotte, Gerard; Hrechdakian, Peter (2015). "New Advances Reconstructing the Y Chromosome Haplotype of Napoleon the First Based on Three of his Living Descendants". Journal of Molecular Biology Research. 5 (1). doi:10.5539/jmbr.v5n1p1. ↑ Herbert, Susannah (12 March 1997). "Father and son in battle for the Napoléonic succession". The Daily Telegraph. London. Retrieved 4 June 2007. Chisholm, Hugh, ed. (1911). 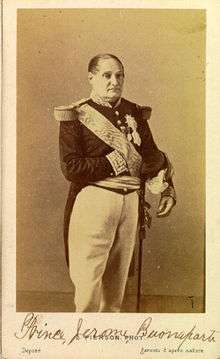 "Bonaparte". Encyclopædia Britannica (11th ed.). Cambridge University Press.